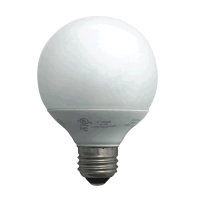 This economical G-25 globe is slightly smaller in diameter than many other globes, making it a bit more versatile. It draws 9 watts of electricity, producing about 495 lumens of light, which is equivalent to the amount of light produced by a 25 to 40 watt incandescent light bulb. Dimensions: Width 3.1", Length 4.3"